Orient Daily reported that testimony of the miraculous feat was shared by Professor Emma David Okafoagu, archbishop of the church who organised a special thanksgiving and ordination service for his resurrected wife penultimate Sunday at Nnewi. “Today is a great day for me. I am using this occasion to dedicate my second journey in the ministry. My wife coming back to life also means me coming to life and it is for a purpose. We have passed the first phrase of our ministration of over 40 years of active ministry”, Orient Daily quoted Archbishop Okafoagu saying during the thanksgiving service. According to him, Bishop Mrs. Okafoagu suddenly fell sick and she was rushed to a private hospital (Ejiofor) in Nnewi. Things took a dramatic twist and she died but instead of making arrangements for her burial, the clergyman decided to seek divine solution after the orthodox medical efforts to save her life failed. Bishop Okafoagu also recalled another incident that happened with his wife 16 years earlier when her wife was resurrected after three weeks. “Our Igwe and Ikedife who witnessed this case are still alive and even came to the recent ceremony of her resurrection”, he said. Okafoagu explained further that the miraculous resurrection of his wife was just a small thing compared to other amazing miracles that God had done through him and his ministry in the past forty-five years of his ministry. “I can never give up on things that I know God can do, even when it seems impossible to ordinary people. My God can never give up. God has done many wonders through me during my 45 years of first missionary journey. That is why I have decided to launch my second missionary journey during the thanksgiving service because I believe my God is alive always and is always ready to answer the prayers of those who believe in him. Narrating what happened to her, Mrs. Okafoagu said: “I breathed my last at Ejiofor Hospital, Nnewi. My husband said the doctor told him that he (the doctor) had done all he could do to get me revived without success. My husband said the death certificate was not acceptable to him even though he said I was about being prepared to be deposited in the morgue. “My husband said he told the doctor that he had just told him the reality on ground. He began to telephone Heaven with his petition to God the Father, God the Son and God the Holy Ghost,” she narrated. She said when she came back to life she was able to recognise people around her as a proof that she was fully back to the land of the living. 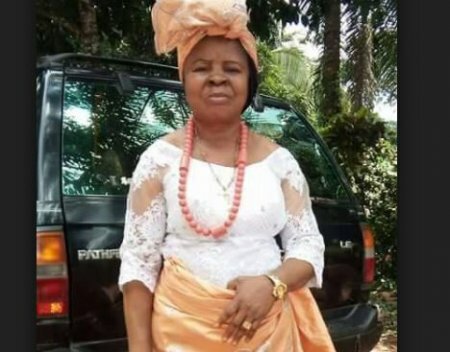 Asked where she saw herself for the whole of the three days she passed on, Bishop (Mrs.) Okafoagu said she never found herself in any new environment or conscious of anything. She used the opportunity to call for people’s repentance and acceptance of Christ as their Lord and personal saviour. Commenting on the miracle, General Bishop Obiora said what happened to Bishop (Mrs.) Okafoagu was a demonstration that Jesus remained the same forever. He said that every believer should work hard to convert more souls for Christ, saying that there was nothing Jesus could not do in the life of those who believe in Him. He called for total repentance of those who had not received Jesus Christ. Dignitaries who attended the special thanksgiving service included Igwe Kenneth Orizu III, the traditional ruler of Nnewi, Bishop Paul Nwachukwu, Founder, Grace of God Mission, Bishop Innocent Erimujor, Bishop Ossy Dominics (National Evangelical Mission), Bishop Titus Orji, General overseer of the Life of Faith Gospel Assembly, Anambra state and General Bishop Emma Obiorah as well as Prophet Chris Ikechukwu of ‘Die by fire’ Mission.